Are you free to speak and meet in Swaziland? In August 2013 the leader of Swaziland, King Mswati III, said citizens should exercise their constitutional right to freedom of speech and freedom of association. Speaking at a ceremony for Swaziland’s police force, the monarch told people not to fear police and to speak your mind. Section 24 of Swaziland’s constitution protects freedom of speech and freedom of the media. However, the call by the king to speak freely contrasts with various media and advocacy reports. A recent article in the Daily Maverick, an online South African news-site, lists the names of people who have been “detained, charged, arrested, jailed this year for their political activities”. The list of names reads: Musa Dube, Jay Naidoo, Paul Verryn, Alec Muchadehama, Vincent Ncongwane, Nomthetho Simelane, Monk Molapeni, Paliani Chinguwo, Zonke Dlamini, Wonder Mkhonza, Bheki Makhubu, Mfanawenkhosi Mntshali, Derick Nkhambule, Maxwell Dlamini and Amos Mbedzi. Recent reports by two international advocacy and research groups, Freedom House and Chatham House, raise further concerns about the lack of media and civic freedoms in Swaziland. 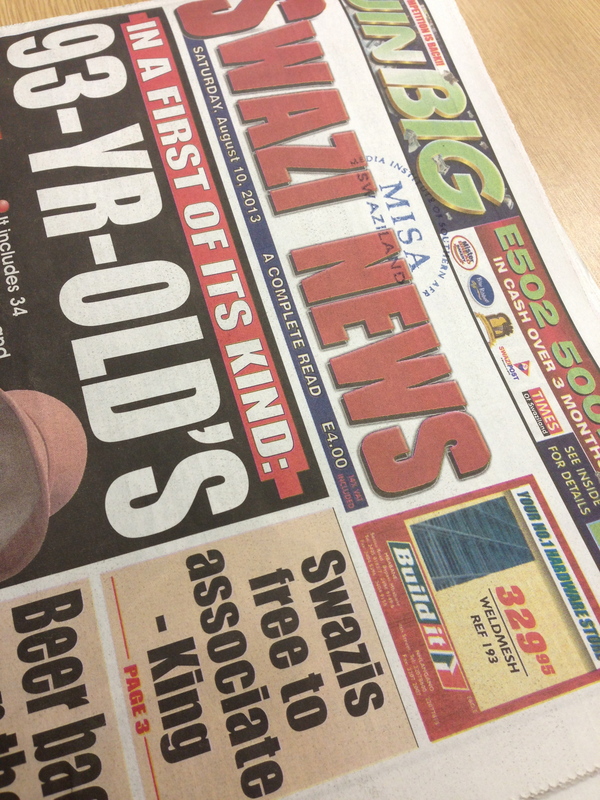 At the same police ceremony last month, the king told the audience that Swazis are also free to associate. Section 25 of Swaziland’s constitution protects freedom of assembly and association. With the national election this Saturday 20 September, Swaziland’s Media Institute of Southern Africa (MISA-Swaziland) asks the question: Are people, in reality, free to speak their mind and free to meet with who they want? You can respond to this question by leaving a comment at the bottom of this page, or by leaving a comment on MISA-Swaziland’s facebook page. Click here to be re-directed to the facebook page. 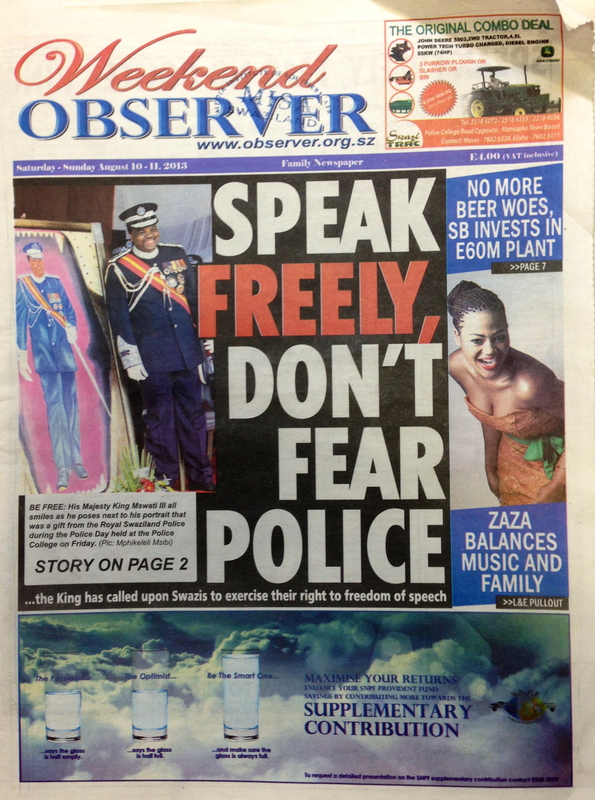 Tags: free speech, freedom of assembly, king mswati iii, swazi news, swaziland, Weekend Observer. Bookmark the permalink.